A rendering of the George Lucas Museum. 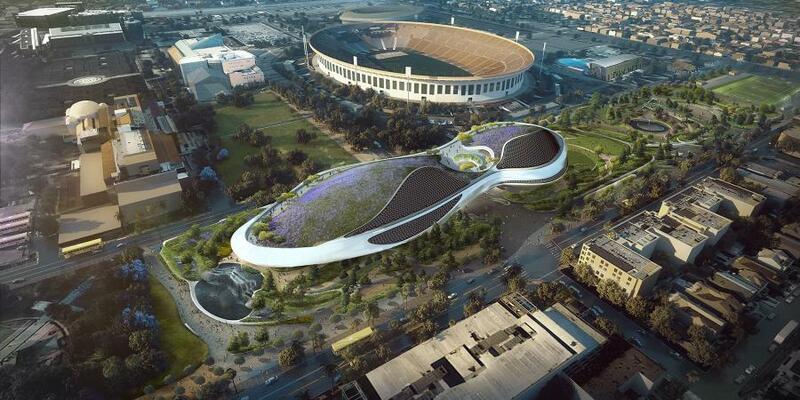 Officials recently broke ground on the site of what will soon be George Lucas' Museum of Narrative Art in Los Angeles' Exposition Park. When construction, which is slated to take about 36 months, is complete, the resulting five-story building will hold narrative art collections, dining facilities, theaters, lecture halls, classrooms and a public research library, Variety reported. The museum, which was designed by Ma Yansong of MAD Architects, will take the site, which was once a parking lot, and make it a cultural hub with 11 acres of new gardens and parks. According to Los Angeles Mayor Eric Garcetti, the construction and opening of the museum is expected to create thousands of jobs, Variety reported. In 2017, Lucas announced that the museum would be built in Los Angeles after his proposals to build it, first in Chicago and then San Francisco, fell through. According to Garcetti, the museum's founders' goal is to help inspire the next generation of creative artists, Variety reported. “Their dream is to ignite the imagination of young people. This isn't something like most museums where they're adding the students later; I think that's where this starts for them,” said Garcetti. When complete, the museum will hold a variety of pieces from famous artists, like Norman Rockwell, along with art from established and new filmmakers, Variety reported. “We're not so interested in the categorization; we're interested in the underpinning of the story,” said Don Bacigulpi, Lucas Museum founding president.